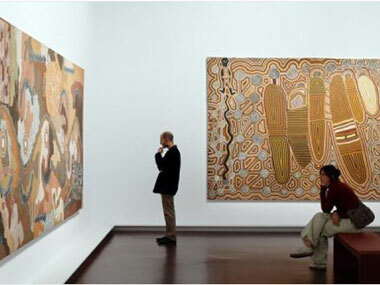 An exhibition of the largest collection of modern Aboriginal paintings to have gone on display outside of Australia has been a major hit with art lovers in Paris. The exhibition, “The Sources of Aborigine Painting”, drew 133,716 visitors to the Quai Branly Museum in the space of just over three months, making it the 5th most popular exhibition the centre has hosted. “We are delighted with the reception it has had,” a museum spokesman said following the end of the exhibition’s run on Sunday. He noted that the success was particularly impressive given that the collection was competing for attention with blockbuster collections of the works of Edward Hopper and Salvador Dali as well as the recently opened new wing of the Louvre dedicated to the Islamic Arts. “It was up against stiff competition in Paris this autumn so it is particularly pleasing that this art, previously unseen and little known in Europe, should draw so many visitors,” the spokesman added. The collection of more than 200 pieces was originally put together by the National Gallery of Victoria in Melbourne. The Branly has ensured Aboriginal art will have a permanent and high-profile presence in Paris by commissioning Lena Nyadby to produce a 700-square-metre work to be displayed on a section of its roof. The black and white work will be visible from different levels of the Eiffel Tower from June 6. Nyadby has previously provided a mural for one of the museum’s external walls which can be seen from the French capital’s Rue de l’Universite.